For SLAM and navigation to work correctly on a ROS based robot it is necessary to accurately specify the transformation between the coordinate system (frame) of the steering center of the robot (the frame is typically called base_link) and the coordinate system of the laser scans. 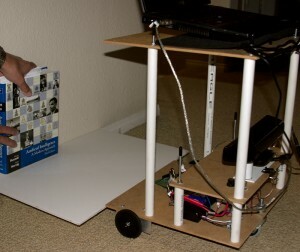 In the case of Kinect based robots the laser scan measurements are derived from the 3d point cloud that is provided by the openni_camera package and is based on the frame /openni_depth_frame. Here is the result of running these commands while running the navigation stack on Ardros (click on the image for a larger view). 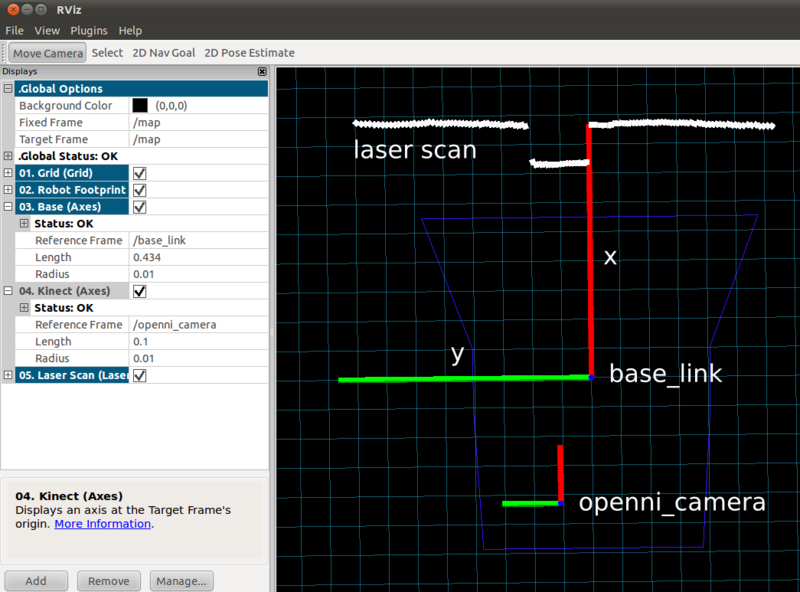 I marked the frame for the laser scan data in red. As can be seen this frame is now connected with base_link. 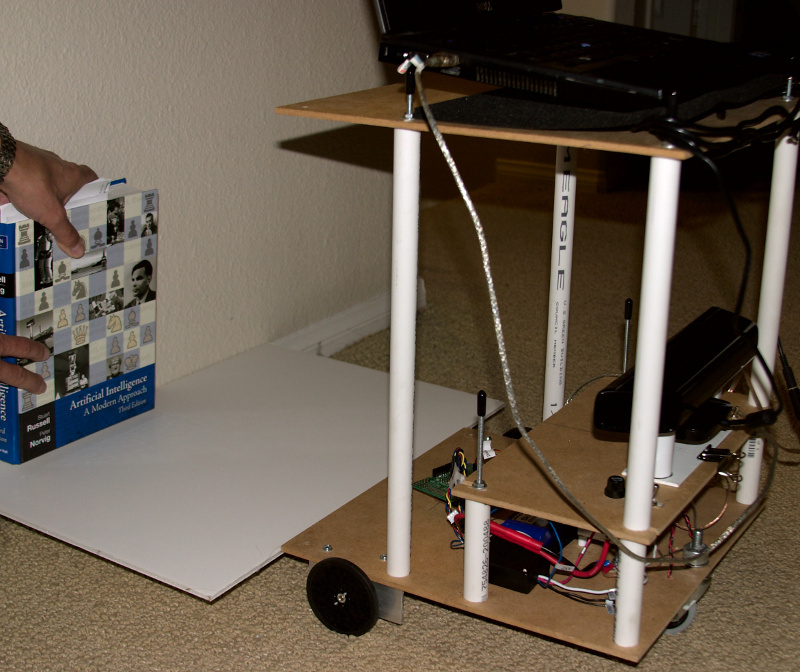 I use a book to create a step change in the laser scan right in the center of the front of the robot. Next I run the navigation stack and bring up rviz with a configuration file that shows the laser scan plus two axes displays for the frames /base_link and /openni_camera. 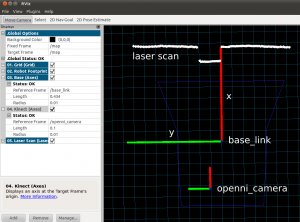 By setting the length of the base_link frame axes to the distance from the origin of the base_link frame to the wall I can readily see whether the laser scan line intersects with the end of the x axis (red). 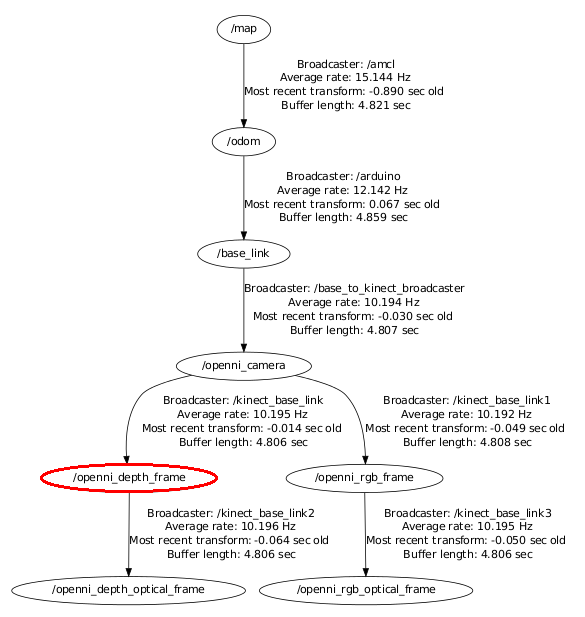 If it doesn’t then the x offset as specified in the static transformation broadcaster base_to_kinect_broadcaster (see the line from the launch file above) needs to be adjusted. Furthermore the step change in the distance needs to align with the x axis. 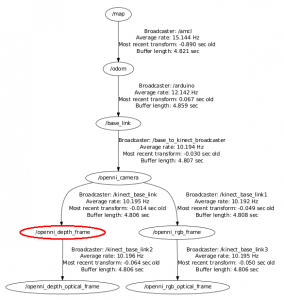 Any mismatch needs to be adjusted by modifying the y offset in the transform base_to_kinect_broadcaster. Once this is done the frames are correctly aligned and the navigation stack can accurately correlate the laser scan with the odometry information. Can you please give your personal mail id? Can i use your blog data for a commercial purpose? What is the license for this materials.